The vision of MOOQ is to foster quality in MOOCs leading to a new era of learning experiences. MOOQ’s mission is to develop a quality reference framework for the adoption, the design, the delivery and the evaluation of MOOCs in order to empower MOOC providers for the benefit of the learners. The main goal of MOOQ is therefore the development and the integration of quality approaches, new pedagogies and organisational mechanisms into MOOCs with a strong focus on the learning processes, methodologies and assessments. To enhance the unique digital market in Europe, MOOQ will lead to new Q-generation of MOOCs that will be designed, organized and tested as qMOOCs. This will be done in close collaboration with all interested partners and stakeholders in Europe and beyond. 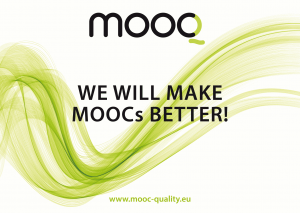 Join our online community for the quality of MOOCs now!